The project „Energiewende.NRW – Bürger gestalten den Umbau des Energiesystems” belongs to the research cluster “Governance & Participation” and is part of the Virtual Institute (VI) “Transformation – Energy Transition NRW”. The project idea is based on a participation-oriented implementation of the energy transition in North Rhine-Westphalia under consideration of a multi-level perspective. 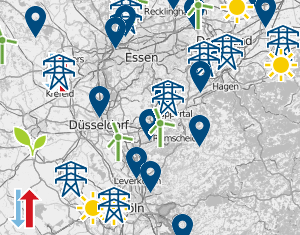 The German energy transition influences various spheres of life of citizens in North Rhine-Westphalia. For example, the energy transition bases on technological developments, policy frameworks or new business strategies, user practices and lifestyles. The analysis of these complex changes, i.e. transitions, is embedded into transition research, where transitions are analyzed using the multi-level perspective. Since transitions mirror radical and structural changes on a regime, the question arises how transitions find their way from niche to the implementation in regime. The multi-level perspective encompasses various forms of transitions and helps to answer this exact question, for example, how new user practices are established. Where and how can social innovations inspire the energy transition? What might be new forms of participation and what is their basis? On which social narratives do they base? Which narratives are viable? How can a multilevel approach be processed so that it serves as a guiding construct for the energy transition? How can practical ideas and impact(s) be achieved on this basis?